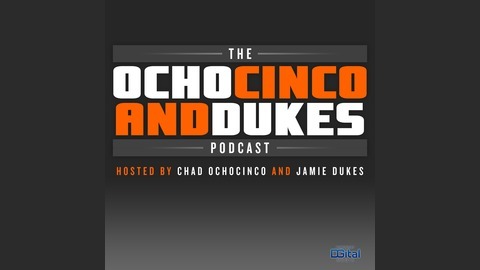 Former NFL big play wide receiver Chad Ochocinco, one of the most unique and entertaining personalities the game has ever seen, teams up with former NFL player and current NFL Network personality Jamie Dukes, for a lively podcast about the NFL, pop-culture and the lifestyle of of one of the most engaging former professional athletes of all time. Coachocinco says "Coaching is harder than playing"
It's been a crazy few weeks for Ocho. A coaching internship with the Cleveland Browns and watching his daughter tear up track meet after track meet. In this episode we'll catch up with #85 to hear what the rigors of being an NFL coach are and if he is in it for the long haul. Plus, RG3 has been named the Browns starting QB and Jamie wants Chad to give his thought's on the misunderstood QB. Chad talks about the concussions Ray Lewis & Ed Reed caused. Plus, the guys talk about Aldon Smith's latest screw up. Is it ever going to change? Dealing with authority and a new opportunity for.......Coachocinco? What's next for Lebron James and will he ever leave Cleveland again?